This page is about the medium tank Leopard 2A5. For other uses, see Leopard (Family). The Leopard 2A5 is a Rank VII German medium tank with a battle rating of 10.0 (AB/RB/SB). It was introduced in Update 1.87 "Locked On". 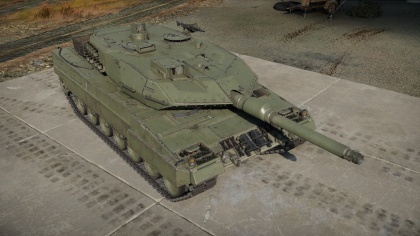 The Leopard 2A5 has improved armour compared to its predecessor, the hull is much better protected and the already impenetrable turret cheeks have more protection on the side of the turret. Add-on armour boosts the ability to protect against HEAT-FS and early ADFSDS rounds. The gunners optic is also moved into the roof to eliminate the weak spot which was easily penetrated by any tank. Be aware of Russian tanks though! Most of them will carry their HE rounds that can easily destroy you anywhere they hit. A hit directly to the turret will most likely send fragments into your hull, penetrate and lets your fuel tank explode or at least set a fire and knock out the gun barrel. Keep in mind that the neutral steering is quite underperforming (way slower than on the Leopard 2A4). 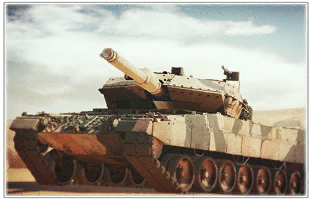 The Leopard 2A5 has access to the DM33 APFSDS shells which make it a deadlier foe as few tanks can stand against it with the exception of the Challenger 2 and T-80U. Hull down: In the 2A4, the gunners optic was easily penetrated so the hull-down was still vulnerable. However, in the 2A5, this weak spot is eliminated and the armor of the turret is much better, so a hull-down position can now leave the Leopard 2A5 invulnerable. Sniping: With the DM33 APFSDS round, the Leopard 2A5 can now make use of the great distance in combat to deal damage while tanking incoming shots. Flanking: Due to the worse mobility compared to the 2A4, it is better to stick to more stationary tactics like hull down and sniping. However, with a little bit caution, flanking can still be successful. Despite all the added armor, the turret ring and driver's hatch are both easily penetrated, and the enemy will most likely aim at these two spots to disable or destroy the tank. In 1988, German engineers began work on modernizing the Leopard 2 main battle tank. Improvements were made to the tank’s defensive capabilities, primarily the turret armour. Moreover, the 2A5 model was fitted with an electric stabiliser instead of the electro-hydraulic variant that the previous versions used. The gunner received improved and less vulnerable optics, and the tank commander – a panoramic periscope with thermal imaging. The build of the driver’s hatch was also modified, along with several other minor improvements made to the general design. Leading to the 2A5 modernization program being officially approved by the military officials of Germany, Sweden and the Netherlands. It is interesting to note that the models exported to the last two countries on the list were actually different from the ones issued to the German army – for instance, the Bundeswehr tanks received no extra frontal hull armour. Production of Leopard 2A5 tanks began in 1995. Overall, 350 earlier-version Leopards were upgraded as a result of the program. This page was last edited on 30 March 2019, at 17:54.